While 14% of the UK population is identified as BME, only 7.4% of paramedics are from BME groups. Nationally just 3.4% of those currently studying to become a paramedic are from a BME background. 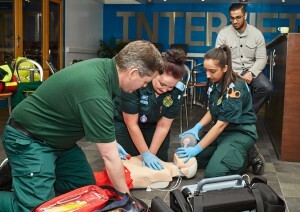 In March 2015 Health Education East Midlands (HEEM) commissioned both Sheffield Hallam University and Northampton University to launch a project to increase the number of Black and Minority Ethnic (BME) learners studying to become a paramedic. The East Midlands has a particularly diverse community, with a varied distribution of its BME population in large urban centres. For example, in 2014, almost half of the working age population in Leicester (46.2%), a quarter of the working population in Nottingham (24.4%) and one fifth of the working population in Derby (19.6%), were from a BME background. However, East Midlands Ambulance Service estimated in 2015 that 3.5% of their workforce have a BME background. The project aims to increase BME applications and enrolments by 10% for the 2016 cycle. 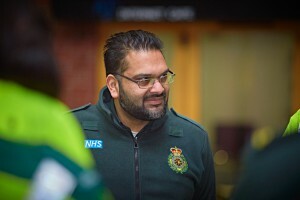 However, it is envisaged that increasing awareness of paramedicine as a career with BME communities should continue to yield further benefits in future years. The project group included staff from a wide range of disciplines, such as from marketing, admissions, UK recruitment, equality and also the health and wellbeing faculty, including a paramedic admissions tutor. This work aims to remove bias at the application stage, whilst also reducing barriers, or perceived barriers, to students during their journey throughout the application process. The team has developed an equality analysis of the admissions process – mapping the entire student cycle to capture and amend where required all processes and interactions with potential students. The project also draws best practice from other Sheffield Hallam widening participation projects. For example, during the application stage staff will identify and support BME students who were initially unsuccessful. These potential students will be offered specialist sessions that support application writing, interview techniques and the opportunity to speak to current students and staff. Research conducted in the initial stages of the project by the team found that images which portray the paramedic profession were not as ethnically inclusive as other health professions and, on many occasions, did not showcase realistic situations. They worked with a local production company to create of images and video, and develop BME case studies, that provide positive role models for prospective students who want to pursue paramedicine as a career. These case studies touch on issues around race and religious barriers, moving away from home, changing careers and give a realistic overview of the paramedic course and profession. The video clips and images can be used in targeted promotional work within BME communities; directly at events, through social media, traditional communications or other targeted marketing activity. Finally, the project carried out outreach work within BME communities in the East Midlands area, including at faith centres and community events such as religious festivals. For example, one of the first activities involved an outreach team visiting a Sikh temple in Derby during Diwali celebrations. 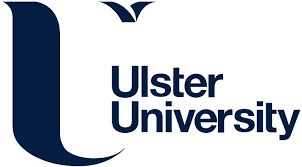 Data collected from attendees who expressed an interested in a paramedic course was added to a Higher Education Access Tracker (HEAT) database, allowing the team to track the interaction between the university and the potential student throughout their journey. After the event the team has been able to contact potential applicants to advise them on applying to the course and invite them to an Open Day.